Earlier in the year I met Kevin and Nicky Mansell from Jersey Canoe Club. Whilst we were washing patatas bravas down with San Miguel after hot day of sea kayaking on the Costa Brava. They invited me and a few friends to paddle with them around their back waters. 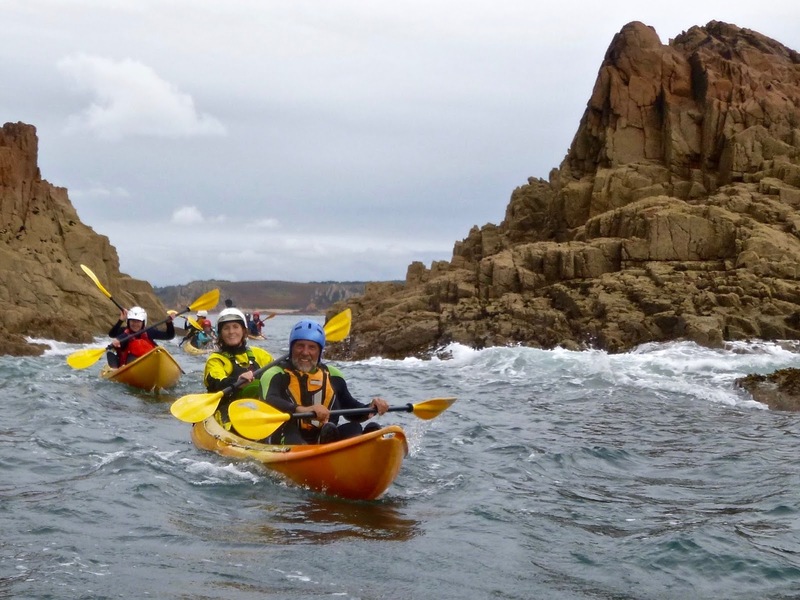 We assembled a team of nine paddlers from Manchester Canoe Club and flew out to the Channel Islands on a Thursday in Mid-September. Kevin and Nicky met us at the airport and showed us to a pleasant campsite close to the Jersey Canoe Club Base on the East side of the Island. We were greeted by the the worst weather imaginable for setting up camp. Persistent rain made the ground unpleasantly squidgy for putting up our tents. Later in the afternoon, as the weather began to clear we headed for St Brelade's Bay where Kevin had arranged a short trip with sit-on-top kayaks. As we made our way beneath the southern cliffs and through the pink granite rock-gardens, we stopped every now and then for some sport! Kevin would clamber up onto one of the more prominent rocks... and jump into the deep water below, and eventually re-surface. Some of us brave fools followed his lead. As the sun sank low in the sky beyond Corbiere Lighthouse, we headed back to St Brelade's for beer and banter. Friday morning was our first day in sea kayaks. 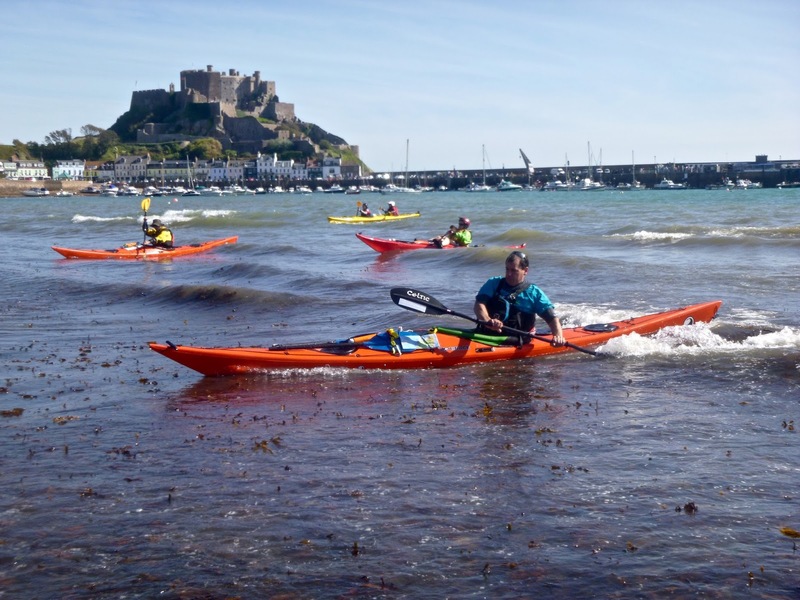 Jersey Canoe Club have a generous stack of Tiderace Vortex kayaks so there were enough to go around. We headed out of St Catherine's Bay, past the breakwater and along the north coast. The strong tidal stream whisked up past deep bays, promontories and tall cliffs until this impressive coastline led us into Bon Nuit Bay. We stopped for lunch in the sunshine before beginning our return journey. 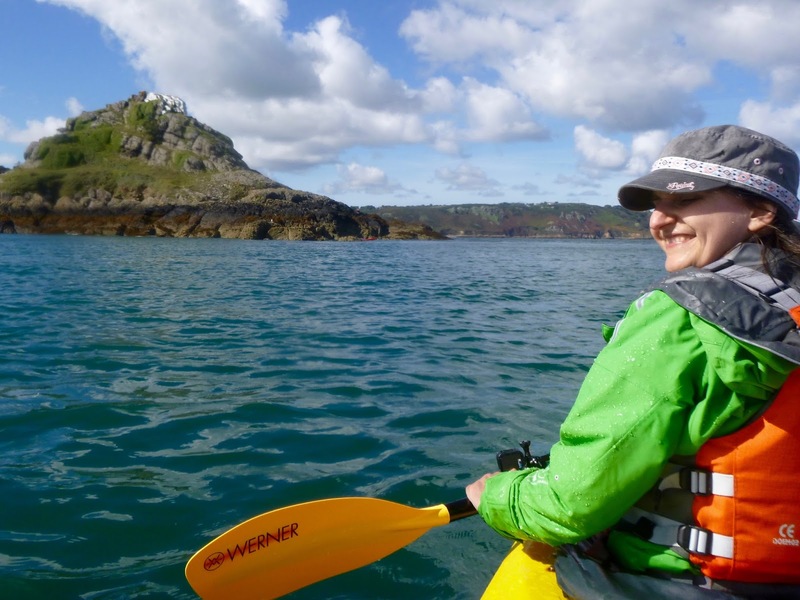 The highlights of the return journey was playing in the tide race at L'Etacquerel and meeting a pod of bottle-nosed dolphins near to Rozel. We were fortunate enough to have timed our visit to Jersey Canoe Club with their annual barbecue. The festivities began soon after we landed with cold beers, greasy burgers and seared chicken wings. It would be difficult to do better on Saturday. However, this time we headed south from St Catherine's aiming for the Gorey Castle. The trip was (yet again) jaw-dropping. The castle commands a high position on the top of a huge cliff that overlooks the harbour. We stopped for lunch admiring the paragliders before setting off back to St Catherine's for a well-earned rest. Our final paddling day was on the north-east corner of Jersey. We joined the Jersey Canoe Club for their Sunday paddle. On this occasion it was from Greve de Lecq to Sorel Point and back. There was plenty of swell creating some challenging dumping surf on the beach. 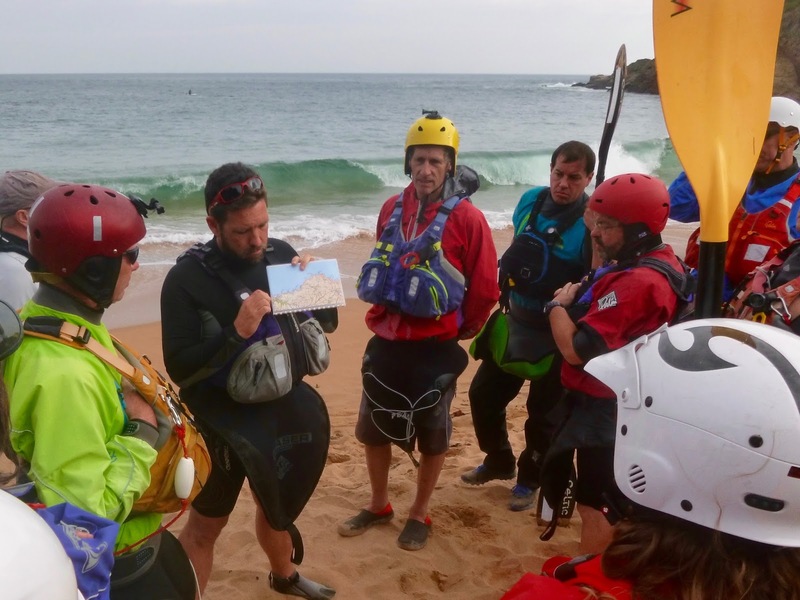 The reward for survivors was to witness the powerful three metre swell breaking explosively on the reefs and cliffs of Jersey's north-east corner. Before catching the evening flight home on Monday evening we spend some time sightseeing in St Helier. 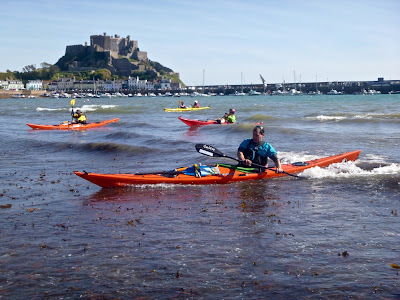 Thanks to Kevin and Nicky Mansell and the rest of the lovely folk from Jersey Canoe Club. Their hospitality was tremendous. We will be back!